Mexican photographer Santiago Arau visited Cape Town in May 2012 and shot the truly exceptional timelapse video Cape Town | One Day in One Minute with a Canon 5D Mark II. Kudos Santiago! Great work! German carrier Condor, based at Frankfurt Airport, will launch a twice weekly direct service between Fankfurt and Cape Town in November 2012. The airline will service the route every Tuesday and Sunday on board a Boeing 767-300 from 03 November 2012. Condor, part of Thomas Cook Group, is currently operating flights to 70 destinations in Europe, Asia, Africa, and the US. The airline operates the Boeing 767-300ER, Boeing 757-300 and Airbus A320-200 aircraft types. British Airways asked its Facebook followers in a recent poll where they want to spend their summer holiday. South Africa was voted the second most popular destination in the poll ony beaten by the Caribbean. Florida in the US became third, London fourth and holidays on the Maledives got listed on fifth position. Many respondents also chose "a relaxing beach vacation" for their favourite type of holiday this summer over "romantic city-breaks", "fun-filled family getaways" and "an all-action adventure trip". Anyway, save travels! The new Mayte Emergency Medical Center, located in one of the most popular tourist destination in Namibia, Sesriem, is now in full operation with a registered nurse, three basic life support skilled personnel and two emergency care technicians. The 10-bed, full-service health center was established in November 2011 by the Mayte Hernandez Foundation in partnership with the Motor Vehicle Accident (MVA) Fund in memory of the late Ms. Mayte Hernandez, a Spanish national who succumbed to injuries she sustained in a road crash in November 2010 while on a visit to the area. The clinic serves as the central point of health care to one of the most revered tourist destinations in Namibia, the Sesriem & Sossusvlei area. It provides not only the much needed emergency services but also clinical and other medical services required by tourists and locals. Before the health centre was opened, the nearest clinic was in Maltahöhe, which is approx. 170km away from Sesriem. update (28 Aug 2012): Emirates is not only increasing flights on the Dubai – Lusaka – Harare route from 5 weekly to daily fligths from 01 October 2012, but is also increasing the capacity. From 01 February 2013, the airline will operate a 3-class Boeing 777-300ER instead of the current 3-class Airbus A330-200 aircraft on the service to Zambia and Zimbabwe. The flag carrier of the United Arab Emirates, Emirates, is currently (since 01 Feb 2012) operating five weekly flights between its main hub in Dubai and Lusaka in Zambia and Harare in Zimbabwe. Due to a good load factor and a rising demand on the route between the three destinations as well as a "testament to the continuous upward growth in demand for our flights to and from the continent" (Jean Luc Grillet, Senior Vice President of Commercial Operations for Africa), the airline will introduce daily flights to Lusaka and Harare on 01 Oct 2012. The Dubai-Lusaka-Harare service is operated by an A330-200 aircraft in a three-class configuration that offers 12 luxurious First Class seats, 42 seats in Business Class and generous space for 183 passengers in Economy Class. 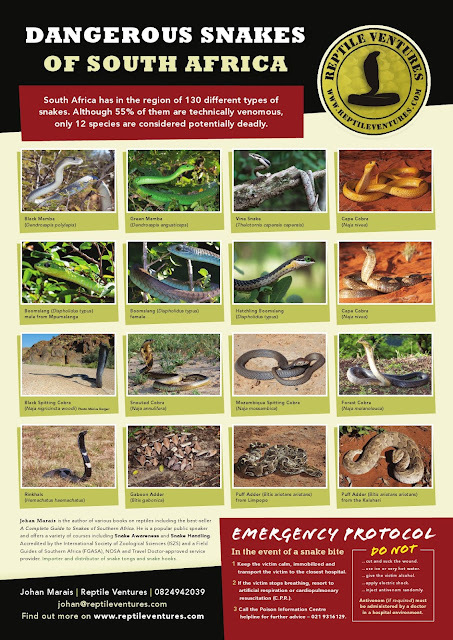 Free poster: "Dangerous Snakes of South Africa"
Herpetologist Johan Marais, author of "A Complete Guide to Snakes of Southern Africa" (available in South Africa via kalahari.net), has put together a poster of the dangerous snakes of South Africa. We got it as a high-resolution pdf from him and - thx to Johan - we can now share it with you! Click here to download it (2.6mb) for free! Great news for all travellers coming to Stellenbosch, located about 50km east of Cape Town, and for all of the town's accommodation establishments. According to the Cape Argus (20 June 2012), the Stellenbosch municipality has, after already providing free wi-fi in the city centre, now also started to introduce free wi-fi to other parts of Stellenbosch, including Cloetesville, Idas Valley and Kayamandi. The farms of Stellenbosch will soon also become part of the so-called "internet connectivity project", which aims at positioning the university town as the "Silicon Valley of Africa". The initiative is a joint operation between the Stellenbosch municipality, Stellenbosch University and Mxit, a popular South Afircan free instant messaging application. The latest Winter 2012 edition of "Wild", Wild Card's wildlife, environment and travel magazine, is featuring an eight page special on Swaziland's Big Game Parks. The parks featured in the article are Hlane Royal National Park, located roughly 70km northeast of Manzini, Swaziland's oldest protected area, Mlilwane Wildlife Sanctuary and the Mkhaya Game Reserve. I just stumbled on a great brand new web series named a Africa on a Plate in which Lentswe Bhengu, a young, hip chef from South Africa, is exploring the wild & real culinary world of Africa. In the first episode, host Lentswe Bhengu shows us how they cook sheep heads, also known as "smileys", in South Africa. In the second episode, he introduces us to one of South Africa's unique Indian Curries and in episode three he shows us his version of a pan fried Yellowtail. We are going to keep the playlist updated! Kudos Lentswe! We love the videos! update (06 Dec 2012): The guys of "Africa on a plate" removed some of the videos, uploaded them again in a different order and produced two new episodes! Global jet fuel prices are currently decreasing and South African Airways has therefore announced certain price cuts. Flights from Johannesburg to various African destinations, such as Bujumbura (Burundi) and Kigali (Rwanda), Point Noire (Congo), Libreville (Gabon) and Cotonou (Benin), will experience average reductions of USD15 per segment (approximately R249 per round trip). Total long haul return ticket costs will be cut by USD7 per segment (approximately R116 per round trip) and domestic return flights by USD5 per segment (approximately R83 per round trip). According to South African Airways, the decreases more than compensate for the European Union carbon emissions tax of between €1 and €2 (between roughly R10 and R21) which the airline will implement next month. The carbon emissions tax is opposed by airlines and governments around the world because it has been unilaterally imposed by the European Union despite proposals by the International Air Transport Association (IATA) for a fair and equitable approach to be agreed under the auspices of the United Nations International Civil Aviation Organisation (ICAO). Good news for South Africans and South Americans alike - the three South American carriers Avianca, TACA Airlines and Copa Airlines joined the Star Alliance, the world's first and largest global airline alliance. The Star Alliance, to which South African Airways has belonged for more than 10 years, now has 27 members offering more than 21500 daily flights to 1356 airports in 193 countries. With Avianca, TACA Airlines and Copa Airlines now being part of the Star Alliance network, passengers from within and outside the region will be able to connect seamlessly through the Copa Airlines hubs in Panama City (Panama) and Bogota (Colombia) and the Avianca, TACA Airlines hubs in Bogota (Colombia), San Salvador (El Salvador), Lima (Peru) and San Jose (Costa Rica). Avianca, the flag carrier of Columbia, and TACA Airlines, agreed to a strategic merger in October 2009, creating a combined network focusing on North, Central and South America, the Caribbean and cities in Europe. The two airlines are currently operating international flights to more than 100 destinations around the world. Panama's national airline, Copa Airlines, together with its partner airline Copa Airlines Colombia (formerly known as Aero Republica) is currently offering flights to 64 destinations in 29 countries. July is movie time in Durban! From 19 - 29 July 2012 Durban will be hosting the annual Durban International Film Festival, the longest-running film festival in South Africa. The 33rd film festival presents about 290 screenings of current films from around the world, with strong focus on South African and African cinema. Screenings take place throughout Durban including township areas where cinemas are non-existent. The Western Cape Transport Department will increase the toll fares for the famous Chapman's Peak Drive in Cape Town from 01 July 2012. Frequent users will receive discounts, with cars paying as little as R6 a trip. Wild Card holders will also continue to enjoy further discounts, starting at R4 up to R26. Pretoria, also know as The Jacaranda City, is not as popular with tourist as neighboring Johannesburg, but is definitely worth a visit. Pretoria has over the years had very diverse cultural influences and this is reflected in the architectural styles, the people and the overall atmosphere that can be found and felt in the city. The city's tourist attractions include the Union Buildings, various museums such as the Voortrekker Monument and the Kruger House, the National Zoological Gardens of South Africa as well as the Freedom Park, the newest (opened in 2009) of Pretoria's popular tourist attractions. The Freedom Park is a monument to humanity, freedom and heritage reflecting South Africa's pre-colonial, colonial, apartheid and post apartheid experiences. If you are planning to visit Pretoria, make sure that you put the Freedom Park on Salvokop on your list. It is a truely inspiring place you shouldn't miss out. Intrepid Travel: 25% off all their tours! Fantastic news from Intrepid Travel - they are offering 25% off ALL TRIPS until the end of June! Including Afria & The Middle East, Asia, Europe, Australia and more! Don't worry if you can't travel at such short notice, there's 10% off for people who can't take holiday before 30th September 2012! The Kapama Private Game Reserve, situated just out of Hoedspruit in South Africa's Limpop province, recently introduced two new cheetahs into the reserve. The animals, a mother and her daughter, are originally from Mountain Zebra National Park in the Eastern Cape, but spend the last year already at the Hoedspruit Endangered Species Centre (HESC), which is located within the Kapama Private Game Reserve. 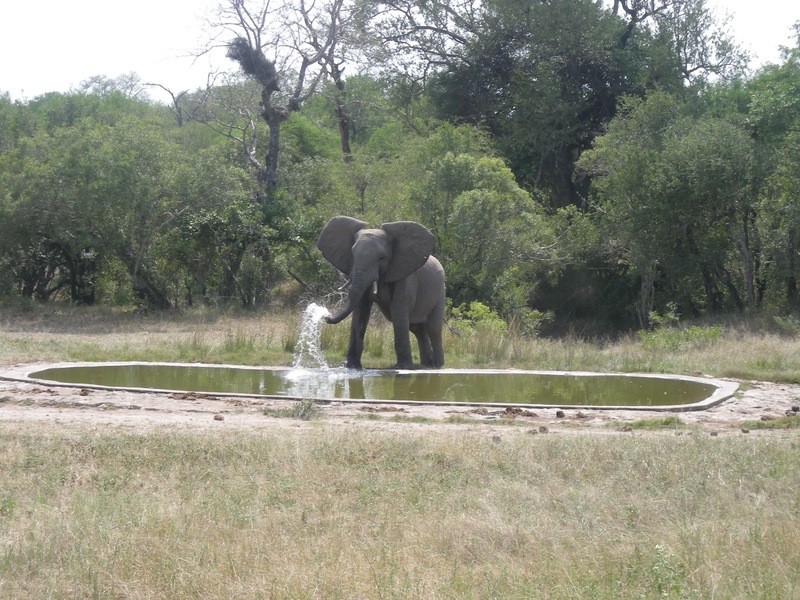 The Kapama Private Game Reserve spreads from the R40 on the west to the Thornybush boundary to the east, and from the Eastgate Airport road to the north to the Klaserie Dam on the south. The reserve's 13000 hectares are home to 42 mammal species including the famed 'Big 5' - lion, leopard, elephant, buffalo and rhino, and approximately 350 bird species. The state-owned flag carrier of Qatar, Qatar Airways, will soon launch flights between its main hub in Doha and Mozambique's capital Maputo. From 31 Oct 2012, the airline will operate three weekly flights between the two destinations via Johannesburg in South Africa. The Maputo service will be operated on Wednesdays, Fridays and Sundays by the airline’s flagship long-haul Boeing 777 aircraft. Maputo is Qatar Airways' 20th destination in Africa and the fourth new route across the African continent (Kigali, Kilimanjaro & Mombasa) to be launched during 2012. According to the latest statistics released by South African National Parks (SANParks), South Africa has lost 251 rhinos to illegal poaching since the beginning of 2012. Kruger National Park remains the hardest hit by poachers, having lost 149 rhinos since the beginning of this year. Limpopo has lost 36 rhinos to illegal poaching; KwaZulu-Natal has lost 25 and the North West province 24 rhinos. Of the 170 arrests made so far in 2012, 147 of the arrested were poachers, 10 were receivers or couriers, six couriers or buyers and seven were exporters. Namaqua NP: 2012 Namaqua Flowers Beach Camp now open for bookings! update (14 Aug 2012): Wild Card Members: 10% discount at Namaqua Flower Beach Camp! South African National Parks (SANParks) announced bookings for the 2012 Namaqua Flower Beach Camp in the Namaqua National Park as open. The camp, which will operate from 15 Aug - 16 Sept 2012, is situated at Delwerskamp, a coastal site about 1km from the Groenrivier office and is easily accessible by ordinary sedan vehicle. A 4x4 vehicle is essential for visitors who wish to explore Namaqua National Park beyond the camp. Activities range from walking along the coastline searching for seals, dolphins, whales, meerkats and other wildlife to exploring the park in 4x4 vehicles. The temporary Namaqua Flower Beach Camp which is now an annual event serves as way for people to experience the splashes of vibrant colours along the rocky coast that Namaqualand is renowned for. Due to a flight occupancy rate averaging 80%, Portugal's national airline TAP Portugal intends to increase its flights to Maputo in Mozambique from currently three weekly flights to four flights per week. TAP is also taking into consideration the possibility of flying to Nacala in Mozambique's northern province of Nampula in case the number of clients is significant and if the airport rehabilitation allows it to host planes operated by TAP. TAP Portugal is currently flying to 80 destinations in 36 countries worldwide. The airline operates almost 2,000 weekly flights with a fleet of 55 Airbus aircraft, and 16 further aircraft servicing regional subsidiary carrier Portugalia. Zimbabwean tourism group Africa Albida Tourism, which is running eg the famous Victoria Falls Safari Lodge and the Lokuthula Lodge in Victoria Falls, released a new video about Zimbabwe putting a focus on the country as a tourism destination in 2012. 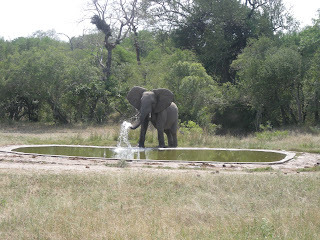 You get info on the current situation in Zimbabwe regarding all kinds of standard aspects travellers are usually interested in - from money matters, medical care and the availabilty of groceries and goods to the current situation of the hospitality sector, petrol availability, transport options and much more. The video is obviously a promotional video, so please don't expect to get to learn about the situation in Zimbabwe outside the (tourism) box. If you are planning to visit Zimbabwe or if you are simply interested in how the country's landmarks look nowadays, the video will be great for you. If you are looking an update about political and the socioeconomic situation in the country, the video won't give any updates. Anyway, it is good to see that at least the tourism sector is recovering and in some cases already back on track. Thanks Africa Albida Tourism for the video! The Convention on International Trade in Endangered Species of Wild Fauna and Flora (CITES), in collaboration with UNTV, produced the movie below titled "Rhino under Threat," which aims to raise public awareness of the current crisis faced by rhinoceros due to illegal killing and the international trade in rhino horn. The movie was first viewed on 18 June 2012 in Rio de Janeiro, Brazil, during the UN Conference on Sustainable Development (UNCSD or Rio+20). The gorges at Kenya's Hell's Gate National Park, located south of Lake Naivasha and about 90km north west of Nairobi, have been re-opened to the public. The gorges were closed for about 2 month ago after a flash flood carried away seven Kenyan youths on a team building exercise. Kenya Wildlife Service (KWS) Director Julius Kipng’etich assured the public that the necessary safety measures had been put in place at the gorges following the subsiding of rains and visitors are now free to access the area. Hell's Gate National Park, covering an area of 68.25km², provides a variety of wildlife (including lions, leopards, and cheetahs), unusual flora and many species of birds (including vultures, Verreaux's Eagles, augur buzzard, and swifts) and is one of the two only Kenyan parks where climbing, walking and biking are allowed. During the Northern Winter 2012/13 season (starting 28 Oct 2012) British Airways will switch its seasonal flight BA042 from Cape Town (South Africa) to London Heathrow from a departure time in the morning to a night time departure. British Airways will operate the flight on board a Boeing 747-400. South Africa's flag carrier South African Airways last week announced the cancellation of its Cape Town <> London service effective August 2012. Tanzania's largest airline Precision Air will change its schedule on the Dar Es Salaam <> Johannesburg route. From 01 July 2012 the current afternoon/night-time service will move to day-time and one of the four weekly flights will operate via Zanzibar on inbound flight (Johannesburg > Zanzibar > Dar Es Salaam). Zambezi Airlines is back in the air! update (18 June 2012): Zambezi Airlines resumed operations on their regional flights on 17 June 2012. Zambia's privately owned airline Zambezi Airlines has announced that it will resume operations. From today (15 June 2012) the airline will initially operate flights ex Lusaka to Harare (Zimbabwe), Dar es Salaam (Tanzania), Johannesburg (South Africa), Ndola (Zambia) and Lubumbashi (Congo) on board a Bombardier CRJ200 aircraft. Zambezi Airlines got suspended from operating on reasons of failing to adhere to safety and schedule regulations as required in the aviation sector by the Zambian Government in October 2011. South African National Parks (SANParks) has released a new promotional video about its Addo Elephant National Park in the Eastern Cape. The short film is highlighting all the different features and activities the National Park is offering to its visitors - from the various accommodation options to game drives and night drives, adventure hiking and horse trail safaris. Well done SANParks! Kudos! Airports Company South Africa (ACSA) has published the on-time performance results of domestic airlines’ flying out of OR Tambo in Johannesburg, Cape Town International Airport, and Durban's King Shaka International Airport in May 2012.